The answer to this question will replace all other information you currently know about yourself. In about a year the IoH will complete the IoT. So be prepared to always be able to show your IP. Here is a HowTo to get your IP right on your wrist whenever you need it. It uses Apple’s app WORKFLOW (for editing and running a set of actions based on iOS APIs) and WATCH. 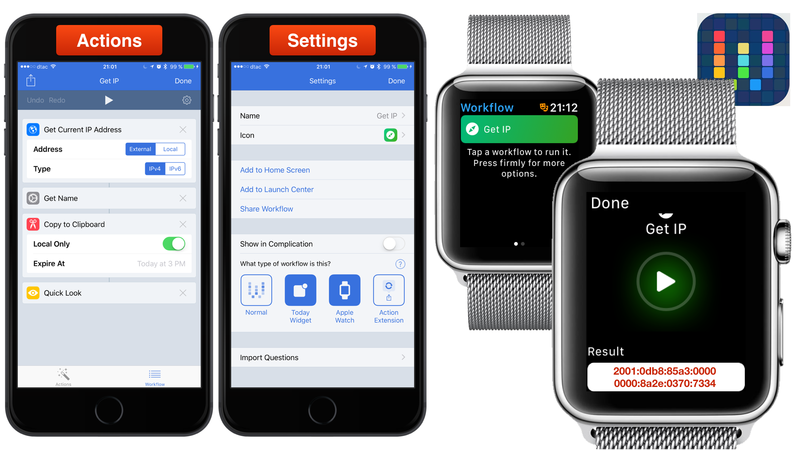 Install WORKFLOW on your iPhone from the App Store and on your Watch using the App WATCH. I recommend to put it in the DOCK of your watch for fast and easy access. Create a Workflow (I called Get IP) within the app WORKFLOW. 01 Open WORKFLOW on your iPhone. 03 Select “Apple Watch” as the type of the Workflow. 05 Go to “Device” and drag “Get current IP Address” into your workflow (on the right side). 06 Swipe right to show the Action menu and select “Scripting”. 07 Go to “Content” and drag “Get name” into your workflow (on the right side) as the second command. 08 Swipe right to show the Action menu and select “Sharing”. 09 Go to “Clipboard” and drag “Copy to clipboard” into your workflow (on the right side) as the third command. 10 Swipe right to show the Action menu and select “Documents”. 11 Go to “Previewing” and drag “Quick look” into your workflow (on the right side) as the fourth command. Now you’ll easily get your IP, send it via AirDrop to the officer who just caught you up so that he can directly charge your credit card you set up in Apple Pay. Here is the link to download my workflow “Get IP”. Follow the instructions for importing it into your WORKFLOW app. You may see this as a workout for your brain and a possible starting point for a great career as an iOS developer.